This year's Sales Management Best Practices were chosen from over 350 entries. With the economic challenges faced by US Sales Organizations this year we have seen some amazing ingenuity in the tools sales managers have developed to coach and develop their sales teams. 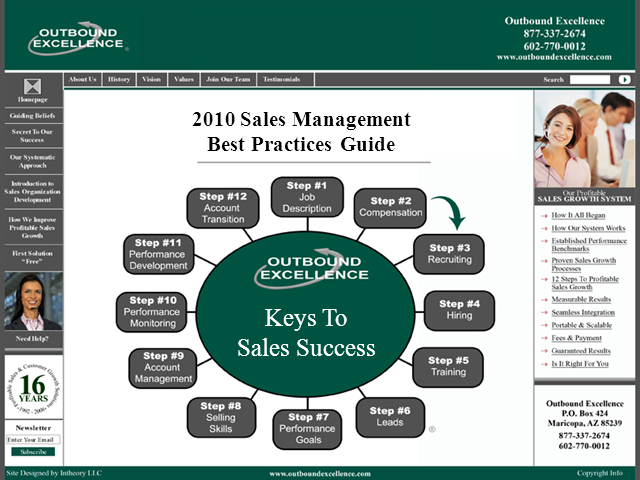 Our 2011 Sales Management Best Practices Guide includes a set of proven turn key best practices for all 12 core responsibilities of the Sames Management Position including: Job Description, Compensation and Incentives, Recruiting, Hiring, Training, Sales Leads / Sales Force Sizing, Performance Goals, Selling Skills / Coaching, Account Management / Account Development, Performance Monitoring, Performance Development, Termination / Account Transition. If you are looking for a set of proven turn key sales management tools - that can have an immediate and dramatic impact on improving your sales organization's performance - tune in for this webcast - you won't be disappointed.